The Customer acknowledges that there are inherent dangers both apparent and hidden associated with surfing. The Customer’s participation in the surf lessons and other associated activities may involve injury. No refund will be made in case of accident or other injury during the stay. The Customer acknowledges and agrees that there is no control in respect of weather and ocean conditions. If the weather/ocean conditions do not allow Boa Onda Guesthouse to provide you all your paid lessons during your stay, Boa Onda Guesthouse do not refund the value of the surf lessons that were not provided. In this case we are able to offer other services in the hotel for the same value. Boa Onda Guesthouse reserves the exclusive right to decide if beach, weather and ocean conditions (or other factors) make the surf lesson unsafe and have the right to terminate the lesson at any time without refund. The Customer is responsible for the equipment provided and should deliver the equipment in the same conditions. Boa Onda Guesthouse is not responsible for any damage or loss of the Customer’s own equipment. The Customer hereby declares that the Customer does not suffer from any medical condition which may prevent the Customer undertaking surf lessons and other activities. Each Customer participates in Boa Onda Guesthouse, activities at his or her own risk. Boa Onda Guesthouse is by law excluded from any liability to the Customer and is not responsible for any loss, damage or injury caused during the stay. Boa Onda Guesthouse reserves the right to cancel any reservation in which case a full refund will be made. 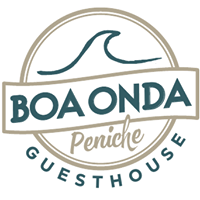 Boa Onda Guesthouse won’t refund any surf and yoga classes or other services in customer’s packages when there’s no major circumstances involved. Each Customer is responsible and liable for safekeeping of all their belongings. Boa Onda Guesthouse is not responsible for any loss or damage to the Customers personal belongings. For surfboards a 100 € deposit will be requested. The Customer should always use the material for its purpose and maintain its good conservation and safety of the same. The customer should deliver the rented equipment as soon as the time period of rental is expired. If the Customer deliver the rented equipment after the time period of rental is expired it will be charged an extra fee. In case of theft the Customer shall submit a criminal complaint immediately and is responsible for the payment of its value. The Customer is responsible to have his/her own insurance covering personal accident which can accrue during use of rented equipment from Boa Onda Guesthouse leaving the full responsibility to the client. For cases not covered by these rules, the parties shall be governed by applicable law.